Mathiston Florist Offers Beautiful Flowers and Gifts to Dazzle Heart. Family-owned and operated, our shop is the preferred florist in Mathiston, Ms. We opened our doors 35 years ago and specialize in delivering courteous and professional service, along with the highest quality floral and gift items around. Our knowledgeable staff is ready to assist you with placing orders for local delivery or anywhere in the world. If you’re not sure what to send, let us design and deliver an arrangement for you using this season’s best flowers. For your convenience, we also offer daily delivery service to Ackerman, Eupora and Maben areas. 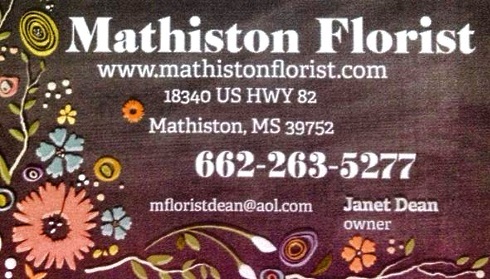 At Mathiston Florist, We’ll Make Your Flowers More Than A Memory. Wedding & Special Event Flowers ~ Whether you prefer a look that is timeless and traditional or sleek and contemporary, we will design your flowers to reflect the occasion, as well as your individual style and budget. Call (662) 263-5277 in advance to schedule a consultation. Let us help you plan your bridal bouquets and wedding arrangements or party flowers for an unforgettable event! Sympathy Memorials & Funeral Flowers ~ Ask our staff about customizing a funeral floral arrangement to a departed friend or loved one. You can always depend on us to design and deliver flowers that will beautifully convey your expressions of sympathy and serve as a lovely tribute to the deceased. Great Gift Ideas for All Ages ~ Liven up any room or office by making a selection from our variety of green plants, blooming plants and dish gardens. We also offer a nice assortment of gifts, including gourmet baskets, fruit baskets, gift baskets, silk & dried floral arrangements, baby gifts, plush stuffed animals, balloons, scented candles, home décor and more! Thank you for visiting our convenient 24-hour website. For flowers delivered fresh order here online, call us, or visit our shop today... We look forward to meeting you!